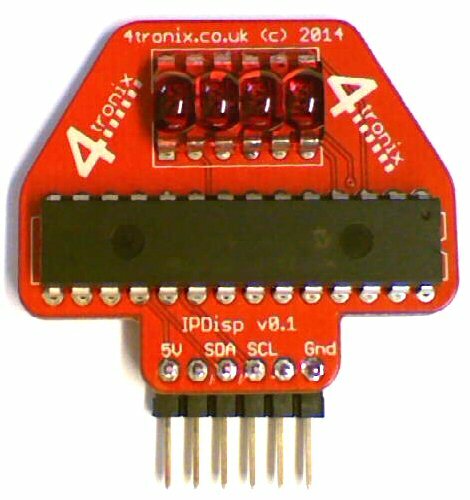 The IPDisp V1 is a 4-digit 7-segment LED display utilising a “retro” LED of the type found in 1970s calculators. 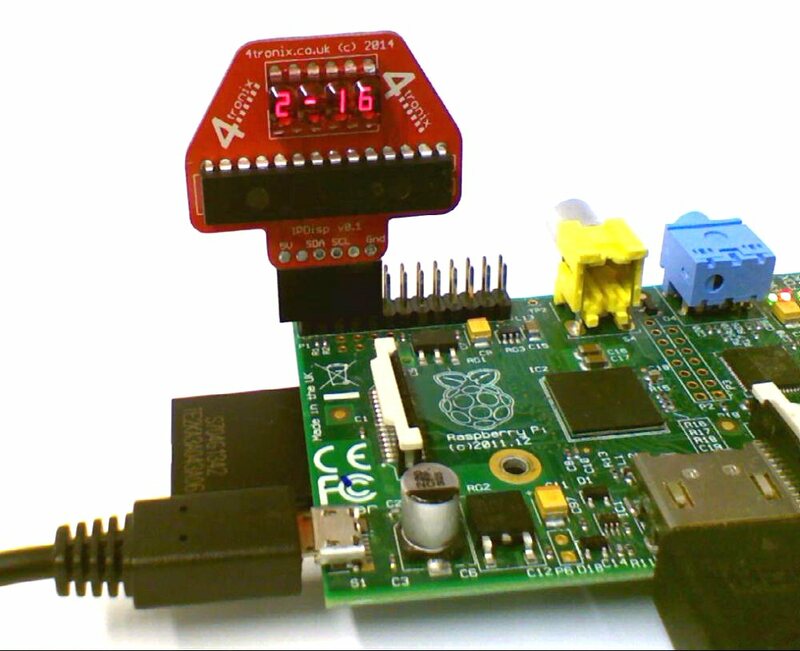 This makes for a cute little display device that can be used to display anything you like that will fit in a 7-segment display. 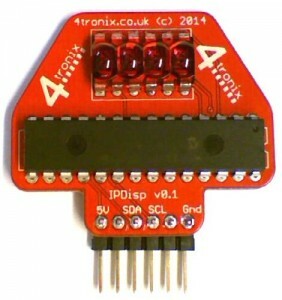 V2 uses a standard 7-segment display which is slightly larger. Both PCBs are the same size: 40 x 32mm (width x height). 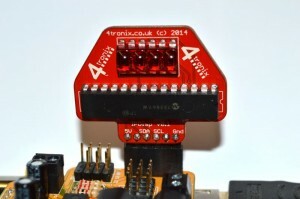 You can purchase it here at 4tronix. It was conceived as a device to help roboteers find the IP address of their robot so that they can connect to it via SSH or VNC for control purposes. Of course you can use a network scanner such as the excellent Fing, but that can become unwieldy in a corporate or educational establishment with a lot of connected devices. This unit is much more fun and can be setup to display the IP address directly on boot up. IPDisp uses an I2C Port expander chip, the MCP23017, to address all the segments (anodes) as well as the individual common cathode digit drivers. The provided software, in Python, time-multiplexes the digits so that each digit is displayed for only 25% of the time. The pinout is designed to match the I2C expansion socket on every 4tronix robotics controller board: PiRoCon, MicRoCon, Pi2Go and PGX. Simple select the type of header you want to use and solder it on. You may want it to lie flat, stand vertical, lie flat but higher up (extended header), etc. Then, making sure that you have it correct way round, plug it directly into the I2C expansion header. Here we show it plugged vertically into the I2C expansion connector on a MicRoCon controller board. Solder across the last 2 pins (5V and “not connected”). This powers the IPDisp off the 3.3V from the Raspberry Pi. Although it “works”, it is not recommended except frr emergencies as it does use too much power for continuous use. This will display the IP address and scroll it across the display a number of times, before quitting. 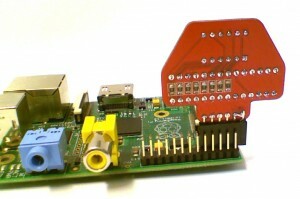 If the Pi is not connected to a network, then it will display 0-0-0-0 and wait until the network is connected before displaying the correct IP address. As the continuous updating of the display is processor intensive, we don’t leave it running permanently. The current version of the software will exit with an exception if the IPDisp is not connected. We didn’t bother to catch the exception as the information is what we need anyway. …and enter the following lines. Note that the Exec line needs to have the correct location for where you have put the program. Exit (ctrl-x) and save (y) then reboot. The IPDisplay will show the IP address of the Pi.